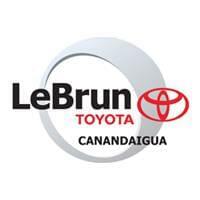 After you’ve taken a Toyota test-drive or two and decided on the vehicle that’s perfect for your lifestyle, you’ll want to meet with one of the Toyota financing experts at our Toyota dealership near Rochester, NY. Our family-owned and -operated Toyota dealer strives to create an informative yet stress-free environment, one in which our customers feel at ease. Whether you’re interested in buying a new Toyota RAV4 or leasing a new Corolla, we take the time to go over your auto loan and lease options in full. Save time at our dealership by filling out a Toyota finance application beforehand, or if you’d rather complete the application in person, we’d be happy to walk you step-by-step through the entire process. Buying a new or new-to-you Toyota is a momentous occasion, and one that our Toyota finance professionals love being a part of. Trade in your used car, secure an auto loan or learn about your Toyota leasing options at our Upstate New York Toyota dealer!